If you like elegant, simple styling, a good amount of cabin space, and all the modern connectivity and safety features all wrapped up into one vehicle that does everything simply and efficiently, then the 2012 Kia Cerato Koup could be for you. Introduced a couple of years ago, the Kia Cerato truly set a new design direction for Kia’s cars, adding a healthy dose of European and styling. The Cerato is smooth, clean, and uncluttered on the outside, with proportions that feel just right either up close or from a distance. With its flowing, gently arced roofline, there aren’t any awkward angles as far as the exterior design goes, and inside, the look is simple, no-nonsense, and stylish as well. Additional refinements are utilised throughout the vehicle to help ensure a comfortable ride while significantly reducing noise, vibration and harshness. It’s fun and easy to drive whether you’re just taking care of personal errands or taking off on a long road trip. Interior appointments are better than most competitors, and the Kia does a great job of sealing out road noise. All Koups are also outfitted with several tech-savvy goodies that come standard, such as Bluetooth connectivity, steering wheel-mounted controls, and voice-activated operation. For all of your audio needs, USB and auxiliary jacks come standard, as does a six-speaker audio system, and for those who need the extra cargo space, the 60/40 split folding rear seats fold nearly flat, giving you plenty of room. The Kia Koup doesn’t skimp on safety either. Safety features include dual front airbags, dual front seat-mounted side airbags, and full-length side curtain airbags. Disc brakes with anti-lock brakes, electronic brakeforce distribution, and brake assist are standard, and the same goes for stability control, traction control, and tire-pressure monitoring. Front active headrests round out the Koup’s safety features. The Koup is more than just a pretty face. Beneath the classy exterior styling lies a well-laid-out interior, which provides excellent space for its class. Add in loads of standard features, and the Cerato Koup is certainly a very attractive option in the budget-coupe segment. 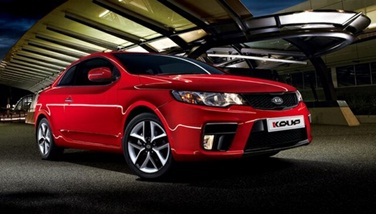 What do you think of the new Kia Cerato Koup?